A new political party founded and led by two former Democratic Party members held a fundraising banquet on Thursday. The Third Side event was attended by several lawmakers and politicians including Chief Executive Leung Chun-ying, receiving wide coverage in the pro-Beijing Wen Wei Po newspaper. The party, which was officially formed on January 3, advocates for a moderate political stance that differs from both the pro-establishment and pro-democracy camps. It was founded by Nelson Wong Sing-chi, a Democratic Party founding member who was expelled in July 2015, and Tik Chi-yuen, the former Democratic Party vice-chairman, who quit the party after attending the World War II military parade in Beijing last year. Tik also supported the government’s political reform package, which was rejected in LegCo last June. Politicians and lawmakers at the banquet. Photo: Stand News via TVB screenshot. Tik is the chairperson of the party while Wong is an executive member. The banquet was attended by high-ranking officials including Chief Executive Leung Chun-ying, Chief Secretary Carrie Lam, Financial Secretary John Tsang and Secretary for Constitutional and Mainland Affairs Raymond Tam. 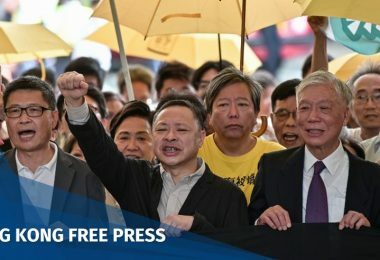 Party members belonging to both the pro-Beijing and pan-democratic camp were present, such as Kowloon West New Dynamic’s Priscilla Leung, New Century Forum’s Ma Fung-kwok, ADPL’s Bruce Liu and the Democratic Party’s Lo Kin-hei. 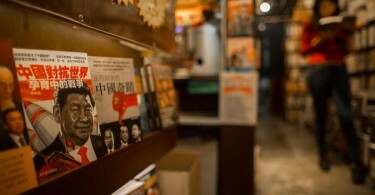 However, there were no pan-democratic lawmakers at the event, Stand News reported. The banquet successfully raised HK$2,000,000. In his speech, Tik said that he was a silly guy, as the middle ground was always the most difficult route to take, but he will continue to “work towards their dream”. The banquet received moderate coverage in the Apple Daily and Ming Pao, but was awarded a half-page spread in the Wen Wei Po, in addition to a 600-word article on a painting given to Tik by famous mainland artist Ma Xinhua. Wong was forced out of the Democratic Party in July over his stance on political reform. The 57-year-old made an open call for pan-democrats to accept the government’s constitutional reform proposal while the party’s official line was to reject it. Tik withdrawn from the Party after attending the victory day military parade in Beijing on September 3, being one of the only three pan-democrats invited to the occasion. Correction: A previous version of this article mistakenly stated the date of Wong’s expulsion from the Democratic Party. He was expelled in July 2015.